A dazzling novel in the most untraditional fashion, this is the remarkable story of Henry DeTamble, a dashing, adventuresome librarian who has a genetic conditon Chrono-Displaced Person that makes him travels involuntarily through time, and Clare Abshire, an artist whose life takes a natural sequential course. Henry and Clare’s passionate love affair endures across a sea of time and captures the two lovers in an impossibly romantic trap, and it is Audrey Niffenegger’s cinematic storytelling that makes the novel’s unconventional chronology so vibrantly triumphant. An enchanting debut and a spellbinding tale of fate and belief in the bonds of love, The Time Traveler’s Wife is destined to captivate readers for years to come. The Time Travelling’s Wife by Audrey Niffenegger seems to be one of those books people either love or hate. It’s not perfect and there were times when it just irked me, but overall, I really enjoyed the story. It’s very poignant, surreal but yet realistic, and has quite a unique concept. Henry, the protagonist, has a genetic condition that makes him travel through time. He never knows when that will happen, nor where and when he will turn up and, on these travels, he can’t bring anything with him, not even the clothes he’s wearing. He arrives to his destination stark naked and with no money, and knows that he can risk ending up in a place from where he can’t get out, or where the weather’s freezing cold, or in numerous other dangerous situations. He is also very aware that if something should ever happen to his feet or legs making him unable to walk, it may very likely be the end for him. On these trips, he meets Clare, his future wife. They first meet when Clare is only five years old and they become (platonic) friends, even though Henry comes from a future when the two are married and having problems. Clare, during the years, falls in love with him too, although nothing sexual happens until she is of age. Clare can’t travel through time and is thus forced to stay behind, worrying about Henry. She never knows when and where he’ll go, nor whether he’ll come back in one piece. They grow up, get married, have a child and face the challenges and problems marriage involves, only it’s harder for them due to Henry’s genetic condition. Despite that, they stay together through thick and thin as they share a special bond that nothing can break. Theirs is a beautiful, very romantic and timeless love story, but the book also makes you think about important issue such as, will the future change if we change even an insignificant detail in the past (a theory they put to the test)? And do we make our own decisions or is our future already written and we’re just following the path that’s been laid out for us? Did Clare ever had a choice in falling in love with Henry? Did he shape her and made her the person she has become? She does seem to depend a lot on him and just keeps waiting, and waiting, and waiting for him. It’s this waiting – waiting for love, waiting to find a sense in their lives, waiting for things to get better, waiting for Henry to come back.. – that’s the main theme of the book. Also, the fact that Henry is able to travel through time doesn’t seem far-fetched or unrealistic. Niffenegger makes it seems like it is absolutely normal. Sometimes the past and present Henry also happen to be in the same place at the same time but, at the beginning of every chapter, the dates and their ages are mentioned, so it never gets confusing for the reader. However, there were a few things that bugged me about the book. Let’s start with the characters. I have mixed feelings about Henry. He’ simply a mess. He drinks a lot, experimented with drugs and becomes quite violent at times. Admittedly,his life wasn’t easy. His mother died in a horrible car crash when he was little and his father became an alcoholic. And then there’s the time-travelling thing. Henry is often forced to steal clothes and money to survive on his travels, which I can understand. Stealing isn’t right but I can see why he chooses to do it. After all, he arrives to his destination naked and without money and who’s gonna believe him when he says he has time-travelled? However, while I can justify him stealing for need, he sometimes steals and commits other bad things (like beating up other guys) just because he can. He does act as an arrogant and selfish brat at times too, but at least he always remains redeemable and being with Claire does make him a better person. A character I really disliked, instead, is Gomez. He had a brief relationship with Claire and then he started to date her best friend Charisse, and the two eventually get married and have kids. He’s a lawyer who represents abused children, which is commendable, but he doesn’t really seem to care that much about his own children. Being with Charisse is for him a way to be close to Clare and, as Charisse herself later says to Henry, he’s only waiting for him to die before making a move on Clare. I found this really disgusting. Although he never tried to come between Clare and Henry while they are together, he should never have married Charisse in the first place. Forming a family, having kids with someone you don’t love while waiting for the girl you do love to become available again is really selfish. Charisse didn’t deserve it and neither did their children. Not that he would ever stand a chance with Clare anyway, but that doesn’t make his actions any less deplorable. Finally, the language. Although the story is really romantic and timeless, it is told in a very boring and dull way. What I particularly disliked was that sometimes, the author starts listing things and never stop. Like when Henry talks about his musical tastes and favourite bands. It’s just an endless list of names of bands and you’re feeling like he’s listing all the acts that’s gonna appear at a free concert. Or when food is mentioned. I felt like I was reading a menu instead than a book. All this stuff is really unnecessary, but if the author really wanted to include it, she should have used a more colloquial style and mentioned a lot less bands/foods/whatever. It was just really boring to read. However, if you like this kind of books, it’s worth it to put up with this kind of writing style till the end, although you’ll often wonder why she did have to go and spoil the book with all those lists.. 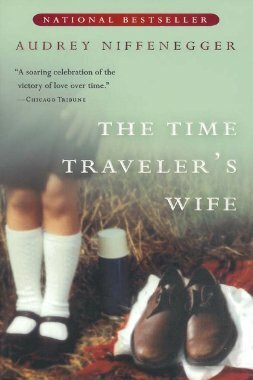 The Time Traveller’s Wife by Audrey Niffenegger is an emotional, timeless and poignant love story that’s surrealist yet feels very realistic. It’s one of those books that really pulls you into the story and makes you want to know what’ll happen next, but it also makes you think about important themes such as love, loss, determinism vs free will and our relationship with time. However, the writing style is not very exciting. There are lots of dull descriptions that make you feel like you’re reading a menu or just any kind of list and that take up too much space in the book. I wish it were better-written but it’s still a very enjoyable book and a good first effort from the author.